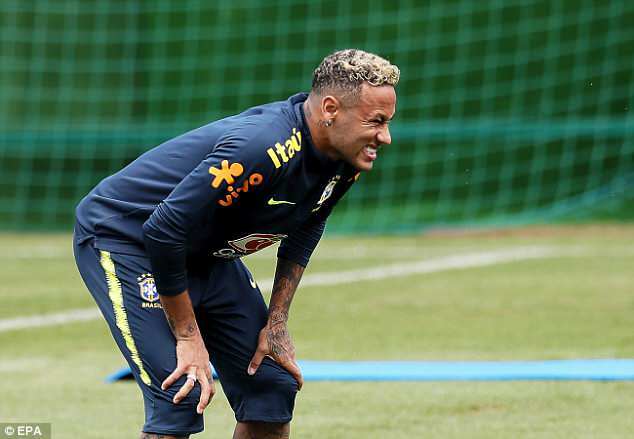 Neymar walked out of Brazil training on Tuesday in serious discomfort due to pain in his right ankle. 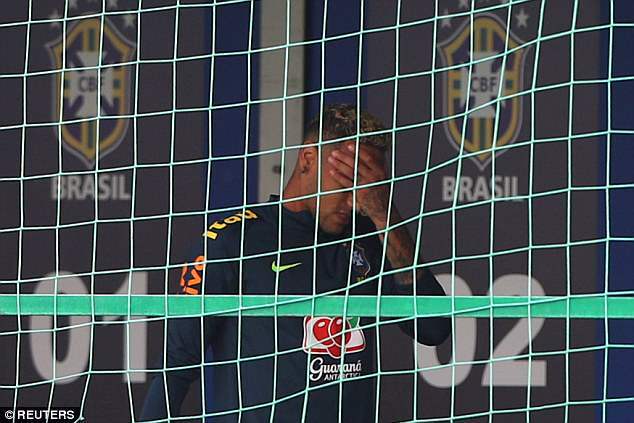 The Brazil striker was seen wincing and covered his face with a hand in distress, sparking fresh fears about his fitness. 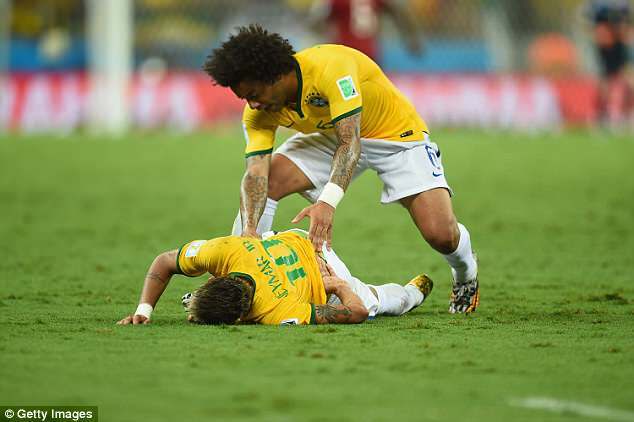 He will spend the rest of the day undergoing physiotherapy, the Brazilian Football Confederation said. ‘He was feeling pain thanks to the large number of fouls he suffered in the Switzerland game,’ a spokesman told reporters. 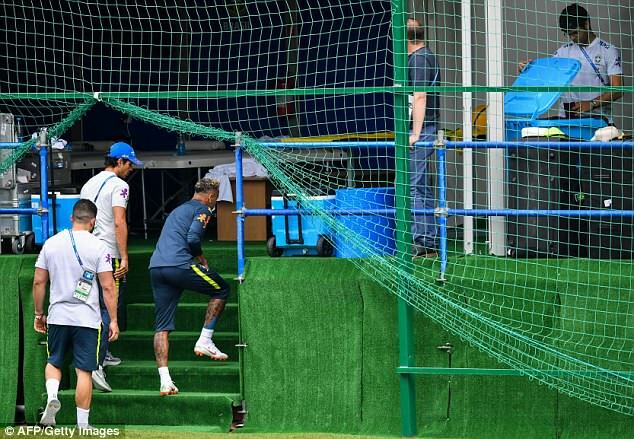 Neymar recovered sufficiently from a broken foot to play in his side’s World Cup opener against Switzerland but is continuing rehabilitation on the injury. And he was accompanied off the training pitch at Yug Sport Stadium in Sochi where he had been working with his Selecao team-mates. Two members of the Brazil staff trudged off with the 26-year-old when he was unable to continue. He broke his foot back in February while playing for the PSG, but updates on social show media that he is still receiving treatment to get it back up to 100 per cent. 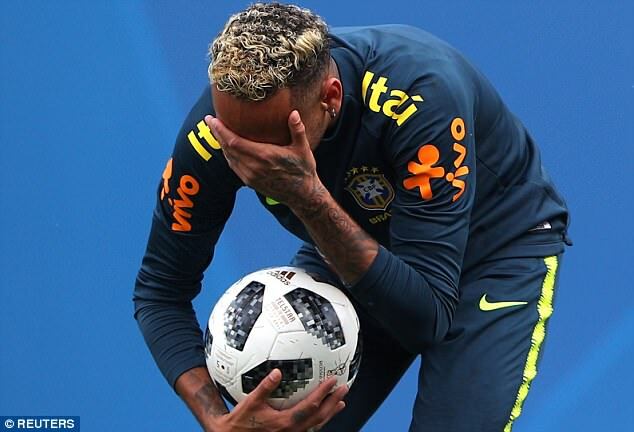 The pre-World Cup rehabilitation process was a long and arduous one and it seems the Brazil talisman is not yet up to speed. PSG’s £198m man struggled to make his mark in the 1-1 draw against Switzerland and was dealt with physically by the opposition. 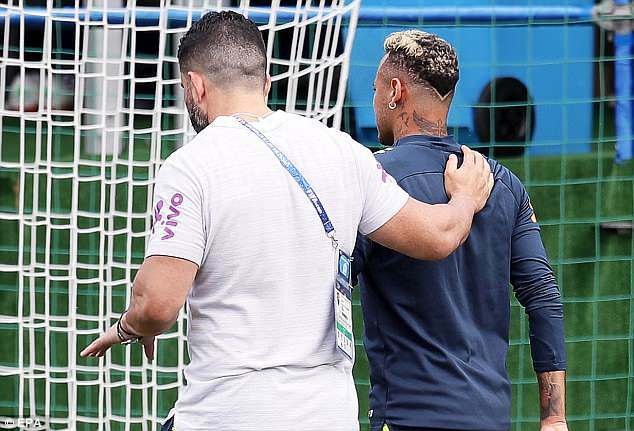 Neymar will expect similar treatment in Brazil’s next clash with Costa Rica on Friday if he plays but there now seems to be a huge question mark over his participation. The forward is all too accustomed to World Cup injury heartache after his involvement in the tournament four years ago was cut short by a fractured vertebrae. At the quarter-final stage in 2014, Colombia’s Juan Zuniga ended Neymar’s campaign in the 88th minute with a knee in the back whilst competing for a ball in the air. No doubt the player and Brazil fans will be praying the prognosis is far better with his ankle injury this time around.